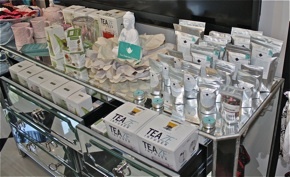 Find a selection of our premium loose leaf tea and teaware at Silhouette. 25g, 50g, 100g bags of Silhouette (custom tea blend just for Silhouette!) and Nap Time. Birdsong, Cherry Blossom and Bone White Kati Cups, Tea Pockets and Teaze Gravity Infuser. Pink and White Mini Me’s.